The IKDT Laboratory is the only clinical laboratory in Germany to be accredited by the College of American Pathologists (CAP) for the highly complex stage diagnostics of heart muscle biopsies. The molecular diagnostic approach of EMBs are based on detection, quantification and sequencing of viral genomes. With permantly increasing number of virus tests IKDT is focused on common cardiotropic viruses which are described as responsible triggers of heart failure problems. Test on cardiotropic viruses are based on qualitative detection of virus by nested-PCR and quantification of virus load by quantitative TaqMan PCR. Depending on the 2 types of viral nucleic acids we perform the isolation of DNA or RNA in separate extraction procedures. In order to calculate and standardize the estimation the virus load in small EMBs (viral genomes per µg human ) IKDT lab apply the most accurate QUANTIFILER TaqMan test (Applied Biosystems, USA), which was primary developed for forensics to detect minute traces of DNA. All amplified virus genomes were sequenced for determination of existing virus subtype or infectious variants. We apply double strand sequencing and subsequent manual alignment against in-house reference files and international NCBI database. Isolation of DNA or RNA is performed from different emdomyocardial biopsies in a parallel manner. During isolation procedure each staff member has to care for nuclease-free working conditions (sterile tips, DEPC-treated water, often change of gloves etc.). After DNA extraction the amount of isolated DNA has to be measured by special TaqMan assay. RNA is completely transcribed into cDNA after DNAse digestion. Finally both nucleic acid fractions are existing as DNA molecules and by this way better conserved from RNAse / DNase digestion. Polymerase chain reaction (PCR) is an artifical method for selective amplification of any desired genome fragment in a very short time by use of a thermal cycler and thermostabile Taq DNA polymerase. We apply this method for detection of cardiotropic viruses likeAdenovirus (ADV)-, Coxsackievirus (CVB), Epstein-Barr-Virus (EBV), ParvoB19-Virus (PVB) and human Herpesvirus 6 (HHV6) gene sequences in endomyocardial biopsies. For all routineously analyzed cardiotropic viruses are used nested-PCR protocols consisting of two sequentially performed PCR assays, where the amplicon of first assay is the template for second reaction. This procedure is highly sensitive and enables us to detect very low copy numbers of viral genes (ultrasensitive). As amplification control there are simultaneously processed serial dilutions of a corresponding DNA-standard for checking PCR process. 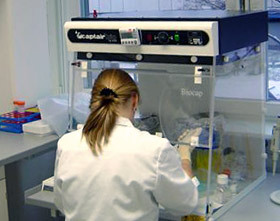 After nested-PCR aliquots of PCR samples are analysed by agarose gel electrophoresis. To the gel is added ethidiumbromide for following staining in UV light (Fig. 7). Documentation of PCR results is done by photographs made with digital camera in the gel documentation system and a printout with a thermal printer. These printouts were ticked to corresponding lab book for long-term documentation. All positive PCR reactions are sequenced as quality control of preceding nested-PCR and for detection of amplified virus subtype. The generated sequences are checked by manual alignment with PHYDE software (Institute of Botanics, Bonn/Dresden) and online with NCBI database for confirmation of corresponding virus strain and / or estimation of specific virus subtypes or variants. Monitoring of successful treatment or therapy of infected patients has to be accompanied by estimation of viral load in EMBs at different time points. Viral load is the ratio of viral genome copies to associated amount of extracted myocardial tissue. In IKDT lab human genomic DNA , as counterpart of extracted biopsy, was measured by quantitative TaqMan assay, which is recommended for analysis of DNA amount in forensic traces by FDA. Quantitative determination of viral genomes by real-time PCR is based on additional use of a fluorescent probes in a PCR assay. By simultane measurement of a calibration curve based on a serial dilution of a plasmid standard the number of viral gene copies is detected during amplification process (Fig. 9). This extreme sensitive and highly optimized method is unique for estimation of viral loads for DNA viruses in human tissues and was also applied in the European BICC trial. IKDT Institute Cardiac Diagnostics and Therapy GmbH in Berlin, Germany, is one of few laboratories in Europe and worldwide which offers human tissue (endomyocardial biopsies) and whole blood testing for HHV-6 by quantitative PCR as medical diagnostics. Portfolio of IKDT includes routine measurement of HHV-6 DNA and transcriptional activity by viral RNA quantification after reverse transcription (RT) in cDNA. These examinations are offered for molecular diagnostics of acute HHV-6 infection, determination of chromosomally integrated HHV-6 (ciHHV-6) and virally-induced myocarditis. They should be performed for characterization of various with this virus associated diseases like roseola infantum, seizures, encephalopathy or Chronic Fatigue Syndrom (CFS) like conditions. Measurement of HHV-6 could be performed in peripheral blood or human tissue samples. What is human herpesvirus 6 (HHV-6)? Human Herpesvirus 6 (HHV-6) is a pathogenic herpesvirus of the subfamily of beta-herpesviruses for humans. HHV-6 is the collective name for both sybtypes A and B, which have a combined seroprevalence of more than 90% in adults. Primary infection occurs at the age between 6 month and 3 years. Little is known about primary infection of subtype A and associated diseases. Sybtype B causes roseola infantum (exanthema subitum or sixth disease), a disease of babies less than three years. After primary infection HHV-6 will not be eliminated completely and remains like other herpesviruses (CMV, EBV, HHV7, HHV8) as latent virus for long time or life-long in the organism. HHV-6 is an immunosuppressive and neurotropic virus, which can induce encephalopathies or seizures. Reactivation from latency by weak immune response like in AIDS patients or after immunosuppression in transplant patients is accompanied by increased viral copies. Immunosuppressive conditions could also be induced by other infectious agents (bacteria, virus) or inflammation. Such subclinical HHV-6 infections can cause dysfunctions of CNS or other organ systems. Recent research results suggest that HHV-6 like other herpesviruses are responsible for manifestation of chronic neurological conditions like multiple sclerosis (MS), some forms of epilepsy or the chronic fatigue syndrom(CFS). Virological diagnostics of endomyocardial biopsies revealed presence of HHV-6 in upto 20% of all examined patient samples, where sybtype B is dominant. Following erythrovirus HHV-6 is the most frequent infectious agent in heart muscle tissue and therefore counts as cardiotropic virus. What is chromosomally integrated HHV-6 (ciHHV-6)? The integration of complete HHV-6 genome into the host cell chromosome is called chromosomally integrated HHV-6 (ciHHV-6). Chromosome telomeres are the preferential, if not the exclusive, sites of intregration. There is no prediction in which human chromosome HHV-6 integrates most frequently. The prevalence of ciHHV-6 in different populations is between 0.2 and 0.8 %. This finally means that in 1 millions inhabitants 80.000 are ciHHV-6-positive. Because the HHV-6 is integrated into the germ line genome a copy of the HHV-6 genome is present in every nucleated cell of the body and will be transmitted on each daughter cell by cell division. By Mendelian inheritance rules ciHHV-6 can be inherited with a 50% chance to each child. It could be also transmitted by stem cell or solid organ transplantion from a ciHHV-6 positive donor to a negative recipient. Even there are no convincing studies stem cell preparations should be checked on ciHHV-6 presence before transplantation. How diagnose different HHV-6 infections? Serological testing by virus IgM or IgG is only worthwile for infants or primary infections, because more than 90% of adults got in contact with HHV-6. Even in case of ciHHV-6, which could be assumed as a permanent HHV-6 infection, serological examination is not useful. Viral DNA in peripheral blood or corresponding tissue is detectable by qualitative polymerase chain reaction (PCR) during acute infection by HHV-6. More exact is determination of viral load by quantitative PCR (QPCR). In the acute phase increased values are detectable which should decline in the following time period. Patients with ciHHV-6 present viral loads higher than 300.000 copies/ml blood (or 50.000 copien/micro;g isolated genomic DNA – IKDT approach) because viral genome integrates in the genomic DNA of each body cell. However this measurement of viral load have to be performed in peripheral blood cells and not in sera or plasma. A convenient method to determine ciHHV-6 is the repeated determination of extremly elevated virus levels after 1 month, as long as there is no other immunosuppressive disease situation. Determination of transcriptionally active viral infection can be performed by measurement of amount of viral RNA by QPCR after RT reaction.This method could be used for monitoring of chronic HHV-6 infection, also for ciHHV-6. Because HHV-6 is suspicious of causative agent for some neurological diseases including Chronic Fatigue Syndrom (CFS) a determination of viral genomes in combination with other herpesviruses (CMV, EBV) in peripheral blood of these patients could be useful, however valuable clinical studies on this assumption are still not performed. What therapeutic options are existing for HHV-6 infections? Vaccines for HHV-6 are currently not available and probably could only applied in infants. There are no approved drugs for treatment of HHV-6 infections. For treatment of the closely related cytomegalovirus (CMV) ganciclovir, foscarnet and cidofovir are approved especially for transplant patients. At severe neurological complications (encephalopathies, status epilepticus) or ciHHV-6 physicians should contemplate an antiviral therapy with ganciclovir or foscarnet which is applied successfully for treatment of cytomegalovirus infections in patients after organ transplantations. Namely there are still no data of clinical studies, but first pilot trials for treatment with ganciclovir of HHV-6 infections of CNS or cardiac patients with ciHHV-6 are running with promising results. In cooperation with HHV-6 Foundation, Santa Barbara, USA, IKDT laboratory is setting up a repository with samples from patients with ciHHV-6 in Europe.